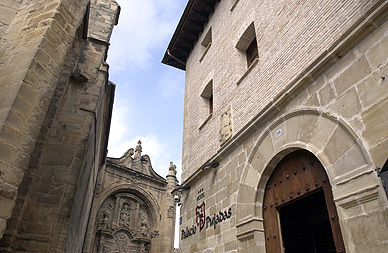 The Pujadas, being descendants of the Valdeolivo Marquis´lineage whose origin came from Aragon, arrived at the town of Viana in the middle of the 17 th century. Rodrigo Pujadas, the Marquisate´s heir, got married Úrsula Remírez de Ganuza the 6 th September, mixing the origins from Calatayud (Aragón), Tudela, Elizondo and Viana (Navarre). A few years later, the Pujadas became delegates or representatives of the Town Hall face the powerful parish church of Saint Peter that was one of the most outstanding in the wide Diocese Calahorra. At the sametime, some of the Marquises -Rodrigo, Juan Bautista, Fausto Eugenio- were Majors of this town which was considered Noble, Loyal and head of the principality of the Old Kingdom of Navarre. At the end of the 18 th century, the Pujadas started leaving Viana because the Marquisate moved and also due to the new duties they were given: the Order of Santiago´s Knights, the Queen´s Esquires and appointments in South America and Philippines. Thanks to their reliable staff, the family has been able to keep and mantain their palace,as well as, their possessions until the beginning of the 21 th century. The present Marquis of Valdeolivo lives in Zaragoza. The palace is situated at the end of the old Saint Peter Street, now called Francisco Navarro Villoslada. Previously it belonged to the Remírez of Ganuza family as it´s proved by the coat of arms of this lineage -eight castles -standing out at the main front. The absence of baroque style in the heraldic sign shows that the building dates from the 16 th century. The building fronts are faced to three streets: Navarro Villoslada, Saint Peter Square and Tidón Street,The front of the mansion facing the main street shows the same building material used in the whole town: ashlars masonry on the ground floor and bricks on the higher ones. The building has two entries, one leading to the Marquis´ bedrooms and the other one to the stables and wine cellars. 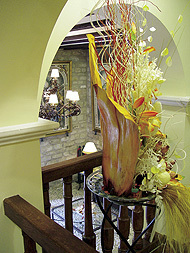 The two beautiful balconies were the perfect place to enjoy the festivities which took place along the main streets. The wider front facing Saint Peter´s church shows irregular-sized windows. This front used to have two doors, two balconies and two beautiful wrought-iron fences in the lower part. According to several inventories and wills, the Marquisate filled the palace with paintings, tapestries, books, weapons, sculptures, relics and documents.